Whether you are kicking off a new web project or just want to explore a new static site generator like Hugo, Gatsby, or Eleventy, you shouldn’t have to start from scratch. Shouldn’t you be able to quickly bootstrap a project, link it to a new Git repository, and deploy it? Oh, and bonus points if you can set up continuous deployment, HTTPS and a custom domain in the same workflow? Yep. We think so. That’s why we’ve started a collection of quick-start project templates. What’s inside Netlify’s free website templates? 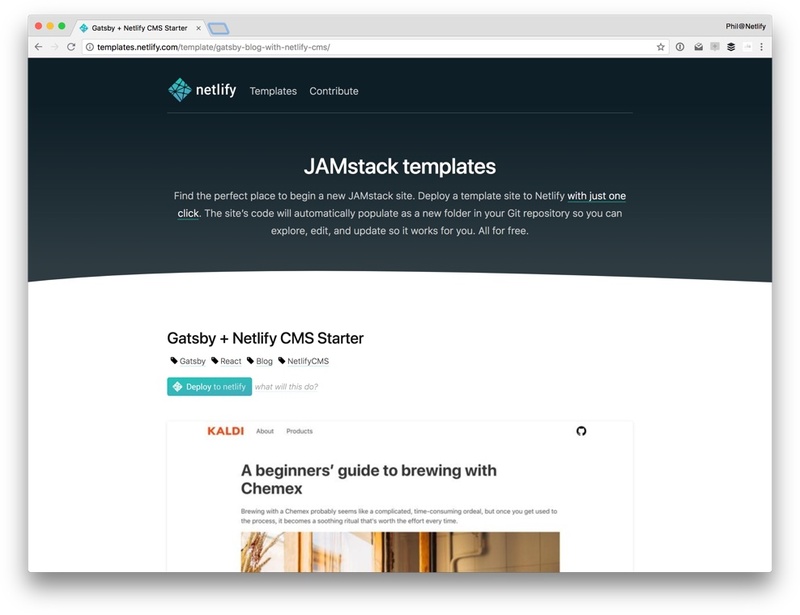 The central requirement for each of Netlify’s website templates is that you can kick off a project with a single click. Each template is a Git repository that you can clone and use either as a starting point for your own project, or as a chance to explore and learn about an particular framework, feature, technology or pattern. Click the Deploy to Netlify button. That’s a production environment you just provisioned! With continuous deployment ready to deploy your changes whenever you push to your new Git repo. Where do I find templates? Each template lives on its own page at templates.netlify.com so that you can bookmark and share whichever templates you find useful. We’ll continue to add more templates, tagging each one carefully so you can easily find what interests you, like Gatsby, Hugo or Serverless. You certainly can. We’ll curate the list quite carefully, but will gladly consider contributions. A well documented Git repo which successfully deploys to Netlify with Deploy to Netlify button is what you need. Ready to try one out? Great. Head over to templates.netlify.com.